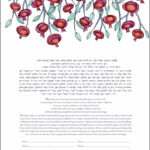 Part of the 2nd generation budget ketubah line. A lush column of green, sprinkled with soft flowers. 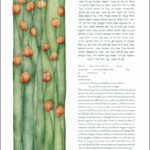 Part of the 2nd generation budget ketubah line. A single tree, two birds contemplate their new home. 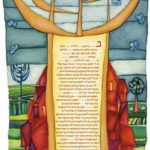 Part of the 2nd generation ketubah line. 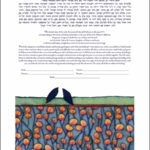 Pomegranates, a traditional ketubah image, fill the top of this ketubah design. 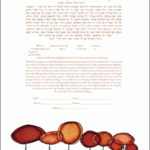 Part of the 2nd generation budget ketubah line. A pair of birds perch on the edge of a field of poppies. 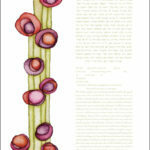 Part of the Clean and Simple ketubah line. 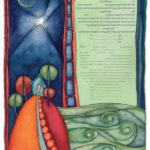 Part of the 2nd generation budget ketubah line. 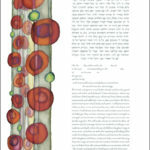 This ketubah features a strong richly toned band of jewel like forms. 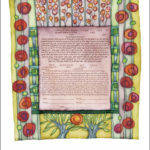 Part of the 2nd generation budget ketubah line. A column of blooms- fresh and vibrant. Idyll In the artist’s charming style, this appealing village scene draws us in, as we enter its peaceful embrace. Hand painted appearance, printed on the finest quality artist stock acid free paper. 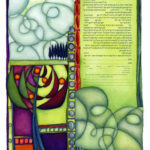 This piece is inspired by tapestry patterns and the intense dewy colors of an early morning garden. Jewel-like organic forms frame the text. Light pink background for the text. 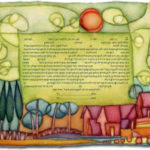 The artist gathered her inspiration for this ketubah from the thought ‘Come live with me and be my Love’; this ketubah’s rich colors and depth are mysterious and romantic. Hand painted appearance, printed on the finest quality artist stock acid free paper. 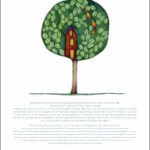 A village sheltering under the symbol of a menorah – tradition and community lyrically imagined. Hand painted appearance, printed on the finest quality artist stock acid free paper.